So you work on a novel for, oh, let’s say six years, and you’re tired in a million ways. You’re wondering, Why would I ever, ever do this to myself again–besides the fact that you have to do it again, because you have a two-book contract. (You’re sure to throw in a little self-recrimination too, because you’re complaining and how many writer friends would want a two-book contract?) And then, a miracle happens. I finished reading your book a few days ago and I wanted to tell you what I thought about it. I really enjoyed it and I’m so happy to have found it. It was the kind of read that kept me thinking for days- at work, at home, and in class. That is when I know a book is really good- when it keeps me thinking, when I wish I hadn’t already finished that novel. That not only makes me happy, it provides me with fuel and makes me want to keep on keeping on. How about you? What motivates you to write? Next week: How to build a Facebook Ad! .-= Erika Robuck´s last blog ..With Hemingway: A Year in Key West & Cuba =-. But in all seriousness, this post in itself is a good motivator to write. When you use phrases like “a million shades of happy” and “in a soft-serious mutter” it makes me rethink my own word choices and scrutinize how I might improve every sentence. I’m ecstatic to hear that you’re working on another book. I’m currently reading Last Will, and so far, I have to agree with all the good comments I’ve read about it. And then he smiled at me. Because he knew it was the truth. Can’t wait to hear more about your next project! .-= Lydia Sharp´s last blog ..Antagonist Tips: Creating a Character We Love to Hate =-. Wonderful, wonderful! Putting together a book and baking a beautiful dessert are both solitary endeavors that find their meaning in the audience. There’s joy in the process — I love to cook and to write — but something extra, something special, in seeing the end result appreciated. Aw what a great email! Congrats! 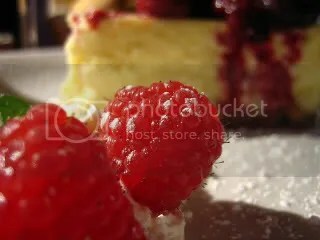 And in a funny coincidence, the BookEnds blog used a cheesecake metaphor today too! .-= Kristan´s last blog ..Rachel Is =-. Yes! Cheesecake! My ex used to make it; she was an expert. All the work developing and producing your writing starts being worth every minute when you get your first “I liked it; may I have some more, please?” comment. That says you’ve accomplished your goal at least once: to create a profound emotional experience. You’ve communicated. .-= Bruce H. Johnson´s last blog ..Tech Writer to Fiction Writer 3: Ya Got a Problem, Buddy? =-. i recently read your book and i’m still thinking about it. how we make so many choices and decisions, never realizing the long term ramifications of them. so much must be fated. Luscious picture and super luscious talents in writing/storytelling/heartfelt sharing…you’ll do it all again to give us THE best! .-= larramiefg´s last blog ..What Kind of Books Are Our Authors? =-. I have to agree with Erika…finding a blurb from an author who has faced the same challenges as I instantly gives me the hope and motivation I need! Oh, what a lovely image. It not only makes me hungry for cheesecake, but gets me ready to chain myself to the computer and write a bit more of my next novel. I agree with you. The contract is the stick, waiting to strike us if we lag. The comments are the carrot…or, in this case, the cheesecake. Thanks for the great, supportive comments, everyone. Lydia, I hope you continue enjoying Last Will! Kristan, that is funny about the dual cheesecake posts. Must be something in the air! Maybe cheesecake fumes. Jamie, there is a place you can order a signed copy of Last Will online: RiverRead Books. If you decide to order, feel free to leave a specific request for how you’d like the book signed in the comments section of the order — otherwise I’ll be creative. Thanks for your interest! Once again, another lovely post, Therese! Definitely meeting the fans and seeing how excited they are to pick up the latest novel in my series keeps me going. I only intended to write one novel for my daughter, and because my fans keep wanting the next story, it’s now become nine!